How do you best learn about wine? Do you prefer to memorize facts? Watch a movie? Meet a winemaker? Visit a region? Take a class? Talk to a sommelier? Drink and read? Read and drink? Just drink? Me, I’m bad at reading non-fiction books. Don’t get me wrong; I have the capability, but DAMN I need some powerful motivation. And retaining the knowledge I gain when reading a non-fiction book is touch-and-go, too. I really need a story, even when I’m reading about wine. Luckily for me, Vino Italiano: The Regional Wines of Italy is a book that works very hard at being all things to all people. It includes profiles of struggling and successful winemakers, typical regional recipes, lists of regional grape varieties and their typical flavors, cold hard facts about regional yields and geography, and recommended wines from producers that can be found in the US. It even provides an ample appendix of Italian wine importers, which I imagine to be useful only to distributors, but hey, why not help them find some good wine too, while we’re at it? I confess that I read some of this book about two months ago and then crammed for much of Sunday to write this review. But that’s another nice thing about Vino Italiano : it lends itself exceptionally well to periodic reading. You don’t need to read the chapter on Tuscany to understand the chapter on Puglia. Hell, you don’t even need to read the whole chapter on Trentino-Alto Adige to figure out what that Alois Lageder Lagrein that you bought on impulse, not even recognizing the varietal, will taste like. One wonderfully unique thing about the book is that it’s equally an excellent reference and a great read. Another thing I really liked about this book was that it doesn’t skimp on the obscure region chapters. Even if Basilicata only has one wine region, dominated by one cooperative and producing only one DOC wines, by gawd they’re going to tell you about the cool local tradition of local winemaking. And if most of the region is dedicated to large quantities of blending wine, they’ll tell you about the man trying to convince the growers that they’ll make more money by harvesting fewer, better grapes. That’s the kind of thing that will really make me go out and hunt down a bottle. The book is divided into three parts: Part One gives you an overview of Italian wine, its history and its (rather arcane) laws. This is a great place to start if you’re not at all familiar with Italian wines, or as a refresher. Part Two is about individual regions: chapters are divided up into an introduction, in which you are introduced to a person in the winemaking biz in the region and told some history. Then you get a map. Then you are told of wines made in the area, usually in sub-chapters titled Vini Bianchi, Vini Rossi, Vini Dolce, etcetera. 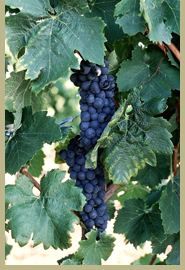 Then you are given some very dry facts of the area, and you get a list of all the grapes grown in the region and where. Then you’re given a description of how the wines taste, along with a few reliable producers. Finally, a typically regional recipe, complete with wine recommendation. Part Three is a collection of indices, including all the grapes, wine terms, and wine zones mentioned in the book. This is where the book becomes a great quick reference. For people studying wine, France and Italy are like Shakespeare and Joyce (not necessarily respectively). There are seemingly millions of books on the subject and long, laborious histories, all of which are intimidating and seemingly insurmountable. But there’s no choice; if you want to have any kind of intellectual spending currency on the subject, you must tackle them. Books like Vino Italiano: The Regional Wines of Italy makes the process inductive, which is to say, they draw you in, show you things you might have otherwise missed, and encourage you to explore. I certainly wish there were an equivalent book about every other country that makes wine. Thanks to the inimitable Dr. Debs at Good Wine Under $20 for founding the Wine Book Club! And to David at McDuff’s Food and Wine Trail for hosting this month! Salud! OK, I know December 25th passed a long time ago, but I can’t resist showing off all the awesome-great stuff that Santa (via my family) brought me! 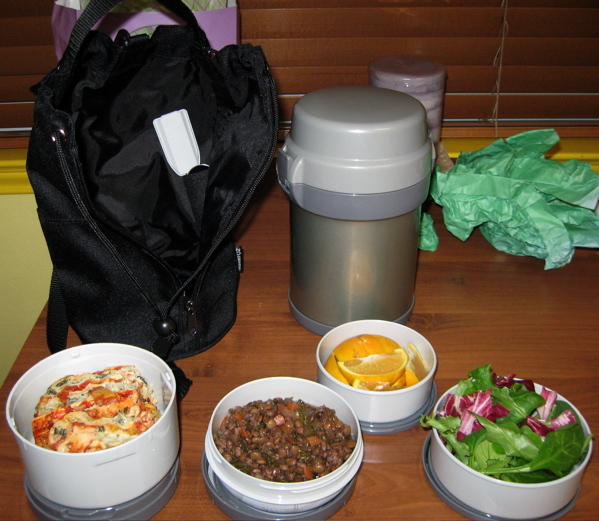 My sister April and her husband gave me a Mr. Bento (which I adore and have taken to work with me every day this year because that’s exactly how geeky I am, thank you) , as well as a bottle of Bonny Doon Bouteille Call (a raspberry-influenced port) and a package of Brix chocolate. April and Jason didn’t know it, but I have a special place in my heart for Bouteille Call; I love the name and package with ridiculous intensity, so much so that I convinced my wine director at Premier to buy 5 cases of it, and then could never sell it despite my love for the wine. I don’t care, though. It’s the bomb, and they discontinued it, making my little bottle that much more precious. 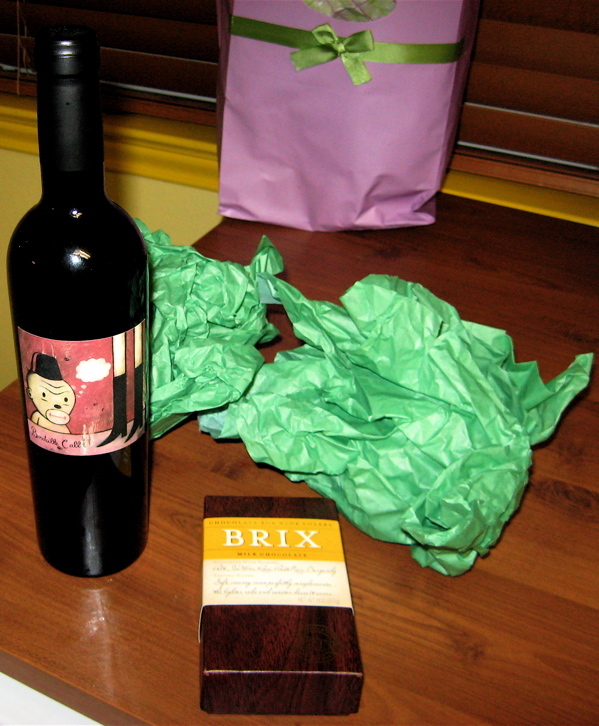 From my sister Adrienne, a corkscrew thermometer and the The Wine Bible . 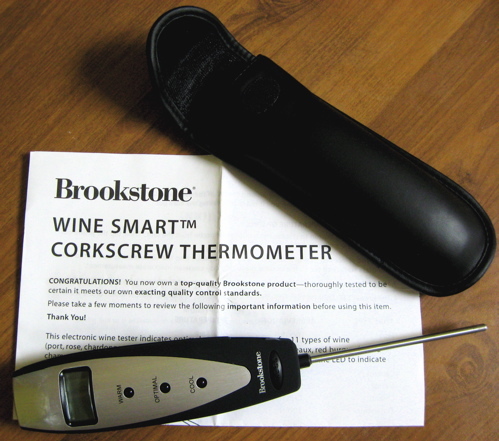 I’ll now be able to geek out with impunity about wine temperature! And I’ve wanted a copy of the Wine Bible for a long time — you can never have too many reference books, can you? 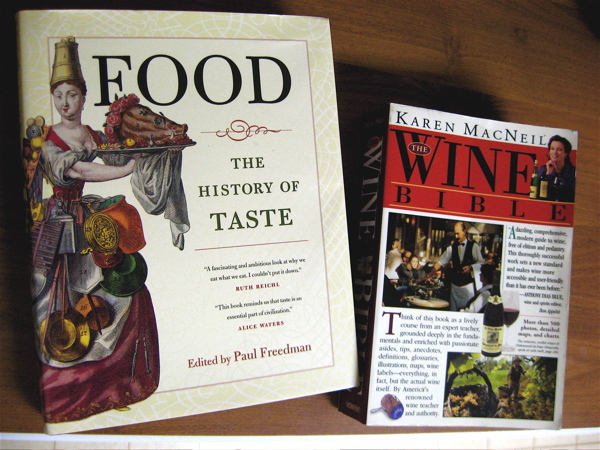 Karen MacNeil is the wine director for the Culinary Institute of America, so I’m figuring she’s got a bent toward wine education – always a plus in a wine book author. From my darling husband, I received a wine club membership to Tablas Creek Vineyard’s VINsider, and my first shipment came in before Xmas, and included two bottles of 05 Esprit de Beaucastel Rouge, and one bottle each of 05 Syrah, 06 Esprit de Beaucastel Blanc, 06 Vermentino and 05 Grenache Blanc. All have been very flatteringly reviewed by Stephen Tanzer. I’ve buried 5 bottles in my cellar, but here’s a picture of the Vermentino, which I did open this weekend even though my nose did not bring its A-game; review forthcoming. Thanks everyone for the fantastic, thoughtful gifts! (In case you think Dad was slacking, his gift came in an envelope and was Ridiculously Generous; I am very grateful.) The best part of the holidays, though, was to spend so much time with family, goofing around, eating, drinking and playing. These times come too seldom, and I relish them.